With one strain of a calf muscle, the complexity of an entire World Cup qualifying group changed. It was just a brief little comment, a throwaway line, but Wales forward Tom Lawrence probably reflected the thoughts of an entire nation when he assessed the impact of Gareth Bale's swollen, but not torn, soleus muscle of his left leg. "It is our worst nightmare," he said of the injury that rules Bale out of the daunting prospect of trying to qualify for the World Cup - or at least earn a play-off berth - via a trip to Tblisi and then a showdown with a Republic of Ireland side with their own aspirations of reaching Russia. For Wales manager Chris Coleman, the challenge of ending the group with four successive victories just got that much tougher, with the statistics doing little to cheer a Welsh public who have waited 60 years to see their side perform on football's biggest stage. The last win without Bale in any competitive contest? A home win over Macedonia in 2013. The last victory without Bale in a competitive contest away from Cardiff? A win over Azerbaijan in 2009. Wales have won only eight of 33 matches without Bale since his debut in 2006 and must now somehow find back-to-back wins without the man who scored or created 82% of their goals in their last qualifying campaign. You would think that enough to make Coleman doubtful, or at least concerned. But the Wales boss has arguably already experienced his worst night in Georgia, an infamous 5-0 thrashing in 1994 when he was part of Mike Smith's side that could not even come close to joining the party at Euro 96. For Coleman, the pressure of trying to qualify is nothing but positive. Coleman believes Wales are already overdue a result without their talisman, insisting there are other players ready to stand up and be counted. "We haven't always had our key players in this campaign. That's international football," he said. "We've got to get on with that - I'm not complaining. We've got to get over that as a team. We've had to go to Serbia without Gareth Bale, we've had to play games without Rambo [Aaron Ramsey], these big star players for us. "Certainly those top three - Joe Allen, Aaron Ramsey and Bale - they've missed a lot of games. But you have to win games and perform without your big players. "I think the word is trust. It comes down to trust and I completely trust them. "If they are not performing and I understand why they are not performing, I think I have their trust that I will not tell them something that is not true, I'd rather just give them the truth whether they like it or not. "And they accept it, that's what it is about, trust. It is not a word in my industry that gets bandied about too often. "I do have complete faith in them - and trust - and I hope they've got that in me. But I think I've had to earn it off them after what happened in the first campaign. That was for me to go and earn that trust, first and foremost." A run of five successive draws in Group D left Wales facing a daunting prospect of needing to win their last four qualifiers, with even that not guaranteeing a path to Russia. Thanks to the heroics of teenager Ben Woodburn that job is half complete, with wins over Austria and Moldova giving Coleman's men a fighting chance. Their prospects hang in the balance, but it is pressure Coleman, now 47, says he has waited his whole professional life for. "It is on a knife edge and we have all been there before, the players have," he said. "How long has it been? Take away the last tournament [Euro 2016]... how long since we were at this stage with something to play for with two games to go? Maybe under Mark Hughes? It's been far too long. "We are in with a great shout and the pressure and spotlight is welcomed by me, I promise you. "Any manager will tell you that you try to stay away from all that. I welcome it. It's great, because I'm always used to 'there's nothing on it'. "We get a couple of good results at the end of the campaign and everybody gets excited, and the next campaign 'wallop', after three games we're out of it. "That's not the case now. It's the second campaign, we've kept the ball rolling and we're in with a shout. The next game it's all or nothing and that's what we've always wanted. "At this stage of the campaign we've been used to playing in front of 10,000 with nothing on the game. Not now. There's everything on it and it's where we want to be." In the absence of Bale, Woodburn could be in line for a first Wales start, while his fellow 17-year-old Ethan Ampadu and Sheffield United winger David Brooks are also in contention. Ben Davies' fine form for Tottenham as a wing-back could have a bearing on whether Chelsea defender Ampadu is handed a shock debut as part of a back three. 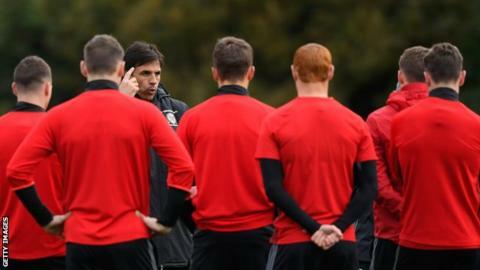 Coleman says he will have absolutely no fears about fielding any of his youngsters. "No, I think I wouldn't have any qualms playing them or if we had to start with any of them," Coleman said. "I know and realise international football is different, you want international players to be playing at the top level because it is an easier transition, but that is not always the case. "But these are talented, they've a lot of work to do but they've shown potential and their mentality. If I had to start them, I'm confident in all of them. "They're here on merit and I would imagine in these next few games they'll be playing a part. I've got absolutely no worries about these players."